For more than four decades now, KELMAPLAST has been one of the leading European manufacturers of polyethylene tape products for the protection, location and identification of pipe and cable lines and for use as cordons and markers. 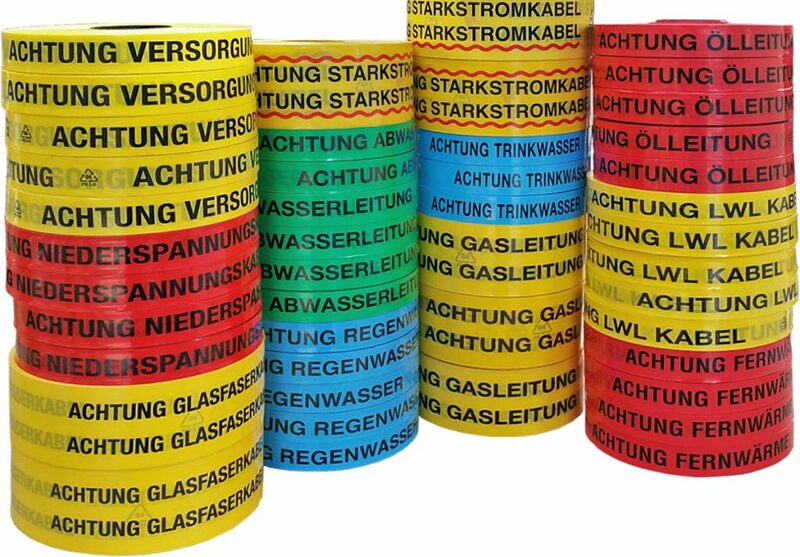 These include barrier tapes, detectable tapes, cable protection tapes, underground warning tapes and cable marking bands. The portfolio is supplemented by adhesive tapes, barrier chains and safety fences. As a special service Kelmaplast offers individual PE sheet production on customer request. The highest product-specific technical standards along with innovative developments tailored closely to our customers’ requirements stand for uncompromising quality in every respect. As a member and sponsor of the Institut für Bauforschung e. V. (German institute of construction research), we always maintain the necessary close connections with our market. We see ourselves as a system provider with an obligation to our customers to support them at every point along the value chain. We aim not only to offer ideas but also to be a reliable partner to our customers and a provider of solutions to their individual problems: innovative, flexible, versatile, uncomplicated and reliable. Environmental awareness is also a key element of our philosophy and one we apply in all of our day-to-day business activities, as demonstrated by our sustainable approach to resources, increasing use of water-based printing inks and introduction of an energy management system conforming to DIN 40001.